“Heal the sick!” The Church has received this charge from the Lord and strives to carry it out by taking care of the sick as well as by accompanying them with her prayer of intercession. She believes in the life-giving presence of Christ, the physician of souls and bodies. This presence is particularly active through the sacraments, and in an altogether special way through the Eucharist, the bread that gives eternal life and that St. Paul suggests is connected with bodily health” (C.C.C. 1509). “However, the apostolic Church has its own rite for the sick, attested to by St. James: “Is any among you sick? Let him call for the elders [presbyters] of the Church and let them pray over him, anointing him with oil in the name of the Lord; and the prayer of faith will save the sick man, and the Lord will raise him up; and if he has committed sins, he will be forgiven.”123 Tradition has recognized in this rite one of the seven sacraments” (C.C.C. 1510). “The Anointing of the Sick ‘is not a sacrament for those only who are at the point of death. Hence, as soon as anyone of the faithful begins to be in danger of death from sickness or old age, the fitting time for him to receive this sacrament has certainly already arrived” (C.C.C. 1514). 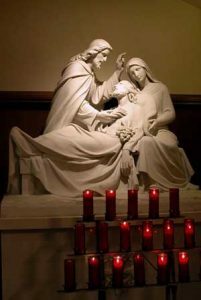 Parishioners are encouraged to contact one of the priests or the parish office if they wish to receive the Anointing of the Sick.